Home » Bathroom Help Category -- Also note those subcategories in the orange navigation, above! 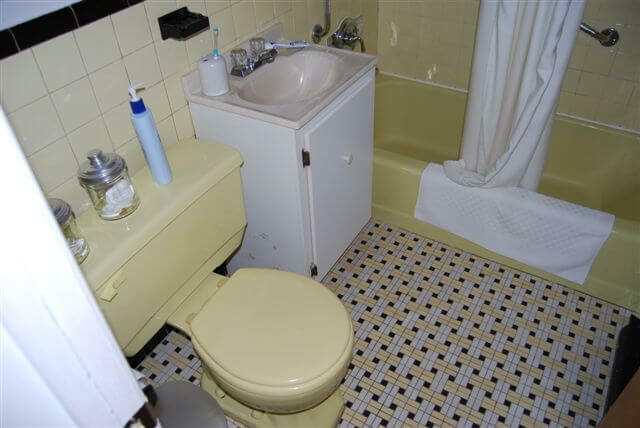 » readers and their bathrooms » Let’s help Sebastian save his yellow bathroom! Let’s help Sebastian save his yellow bathroom! 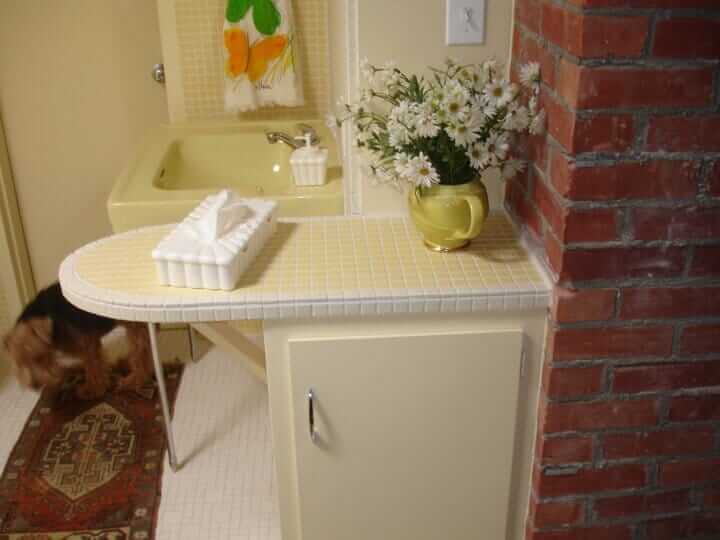 Being born in 1973, I have not known the era when yellow, blue and pink tiles were “in”… But, after 3 years in my house, I have come to like my yellow bathroom and would like to renovate it respecting the style and color… an idea that pleases you I’m sure! Attached you will find some pictures of it. 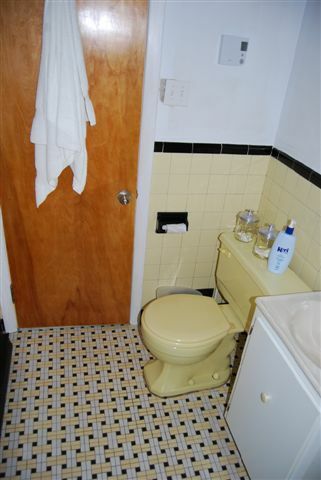 on your site the Olympic Tile store probably have some replacement yellow and black tiles. I would like to redo the window frame in black tiles instead of wood. What kind of sink should I buy? How can I give back some shininess to the floor? What color should I paint the walls? Do I keep the mirror? 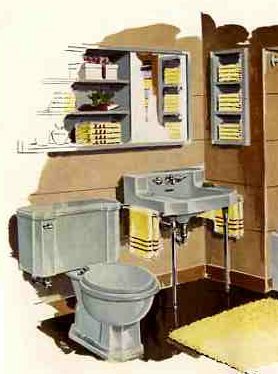 Do any of your readers have the same kind of bathroom? Well, any help would be appreciated! And I would be happy to start the “save the yellow bathrooms” movement. Didn’t I say this was a great letter?! 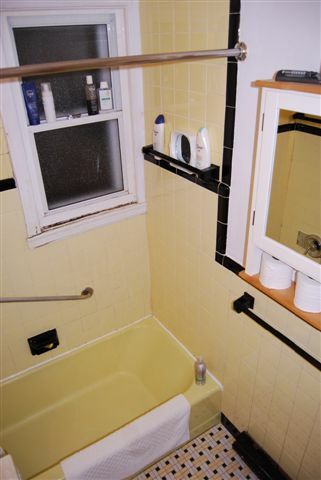 Sebastian – I am so proud of you for doing things the hard way – and saving this yellow bathroom. It is the right and noble thing to do!!!!! And, it will make you very very happy. Well, Sebastian and I have emailed back and forth this week, and I have a bit more information. First – as you can imagine – storage space is actually a big issue. 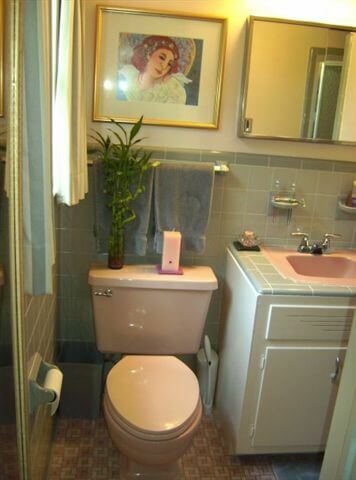 The vanity, as inappropriate as it is decoratively, actually serves this purpose well. 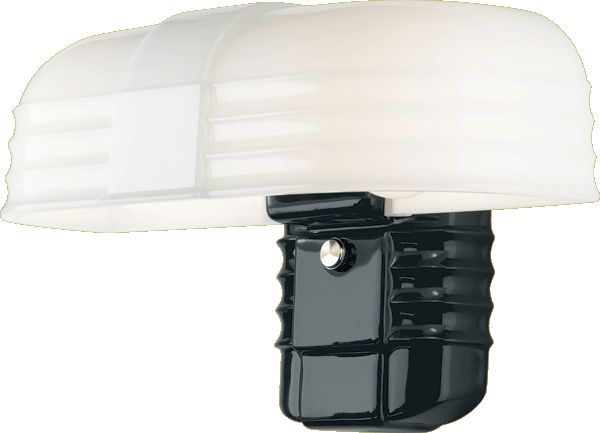 But, it also turns out that there is 8″ of depth in one of the walls. This is important, I think. concerned about the shipping cost. Even more importantly, he really needs to try to match the Case yellow – this is crucial, as your eye will pick up the difference. So he is going looking today at a salvage place that may have a match. 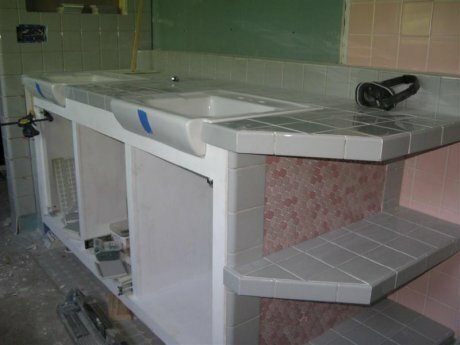 Even if it takes a while to find the right sink — I think it’s the smart thing to do — and now that you’ve put your retro reno vibe into the universe, Sebastian, the sink will come to you! With the bathroom being so compact, having the wall-hung with legs will really make it feel more spacious. the mirror – extending to the edge of the toilet, “centering” the entire installation on that wall — to provide more storage space along this wall. I think that open shelving like in this photo would look great; but would not be practical; put part of the cabinet (to the far left, shelves in the middle) behind a door of some sort. 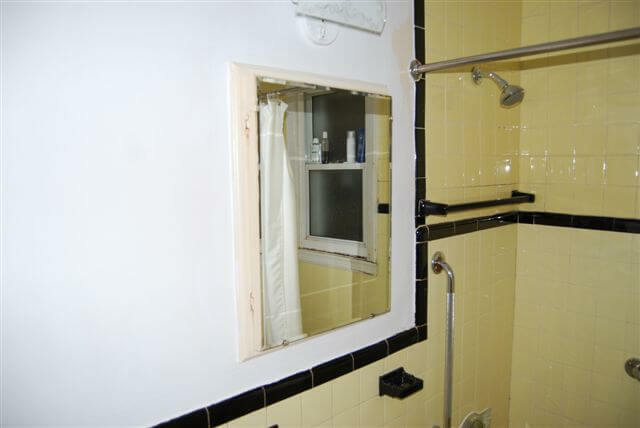 Everyone: If you have a lot of space behind a bathroom wall – use it. I did, and it’s great. 8″ is a wonderful depth, actually – nothing gets lost by being too far back, yet it’s deep enough for large bottles like woolite. you. It is perfect with your black trim and overall deco look. if treated wrong. You want to soften it a little. This paper or one like it, would do that. 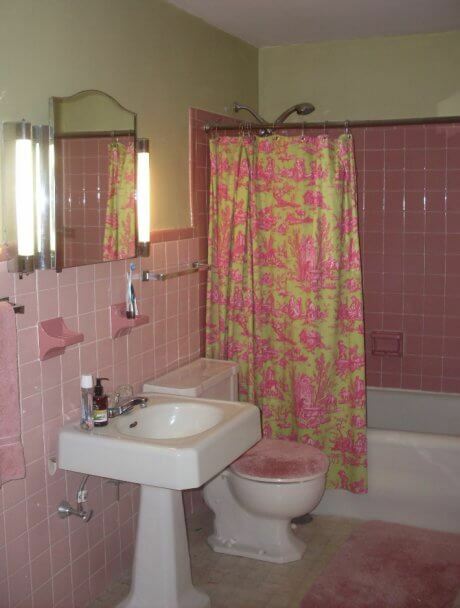 This wallpaper also gives you the ability to work in other colors – blue or merlot towels and fluffy rugs, for example. Again – you must also have some good sources in Montreal, tres chic! 5. Tile around your window? Sure, but please note, it will be difficult to match the ‘mud set’ look of your original tile unless you get someone to do this who really know what you are doing. If you can’t find someone, I would be cautious. If the wood is rotted out, as an alternative, you can replace it and use marine paint for better water resistance. I’m sure a good lumber store will even tell you a wood species to use that’s best for this situation. 6. Polish your floor tiles? Nope. I think they are meant to be matte, Sebastian. They are fantastic, btw!!! 7. Accessories: Once you get the wallpaper in, these will play out. Have fun with towels and rugs. Re the shower curtain, I tend to favor something that blends in rather than stands out, but this is not a hard and fast rule. Find vintage switch plate covers for your electric outlets and light switch. You can also find new models of chrome exhaust fans for the ceiling exhaust that I see in another photo. So, I hope this helps, monsieur. Retro Renovation readers — what are your ideas for Sebastian? I have a retro bathroom and I decided to add vinyl wall decals of different black and white vintage barbershop signs, mustaches, beards and haircuts. The other one I did different chandeliers. You can pick a theme and change them out if you get bored. 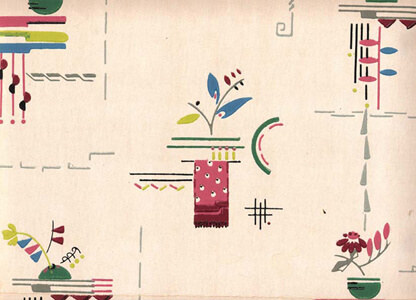 You can do vintage perfumes and powder puffs, nail polish and it will look like an original wallpaper. It is endless. Also you can buy stencils and paint a wall paper effect on your wall.